January 18, 2016 – It is widely known that rocket engines tested at Stennis Space Center will launch NASA’s new Space Launch System (SLS) on its missions. What is not so widely known is that the south Mississippi center also is contributing to the propulsion system that will power the Orion crew vehicle once it leaves Earth’s atmosphere and separates from the SLS. 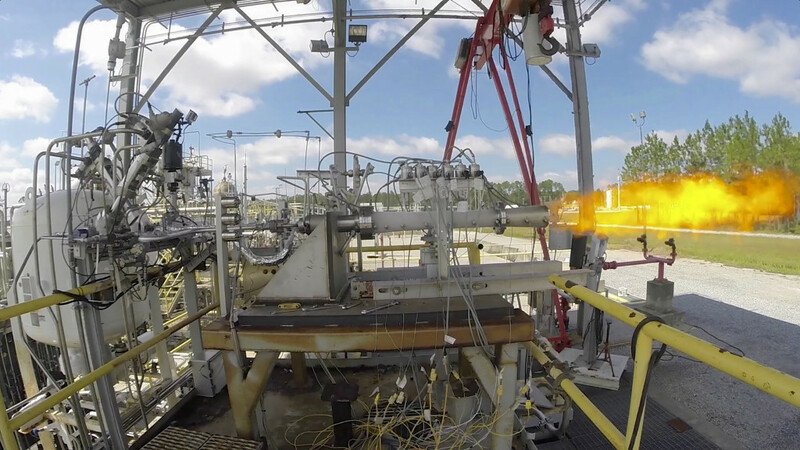 Earlier this fall, Stennis engineers completed a series of tests on a subscale diffuser system, providing valuable data for the final development testing of the engines that will provide the power Orion needs for deep-space missions. In late October, Stennis engineers concluded a subscale diffuser test series that recorded 38 hot fires for a total of 172.46 seconds. Data gathered from the testing of the subscale configurations now will be used to build a full-scale diffuser chamber at NASA’s White Sands Test Facility near Las Cruces, New Mexico, which will be used to provide a simulated space environment during an actual hot fire test series of the Orion service module propulsion system. The diffuser system is needed to test the Propulsion Qualification Model (PQM) that will power the Orion spacecraft in space. Orion is being built as the exploration vehicle for NASA’s upcoming deep-space missions. Launched atop SLS, it will carry mission crew members to space, provide emergency abort capability, sustain crew members during missions and provide safe re-entry to Earth. Orion will need propulsion capabilities during the missions to maneuver and ensure proper trajectory, which is where the PQM comes into play. The test article consists of the heritage Shuttle Orbital Maneuvering System Engine, eight auxiliary engines, and 12 reaction control engines, together which provide the necessary propulsion and control capabilities to successfully operate in space. The testing activities at Stennis were designed to gather data on how the full-scale diffuser needed to be configured in order to support the testing of the PQM. The test series involved firing a low-power thruster horizontally through a scaled-down nozzle extension and diffuser. Data was gathered on the performance of several subscale diffuser design configurations so full-scale diffuser design details could be finalized in support of actual fabrication. Tests were conducted on the E-3 Test Stand at Stennis across a number of days in September and October, 2015. NASA is building the SLS rocket to power missions deeper into space than ever before. Stennis Space Center is testing the RS-25 engines that will help power the SLS core stage on launch. Once the engines are tested, Stennis will test the SLS core stage in a four-engine configuration on the B-2 Test Stand. This core stage assembly will then be shipped to Kennedy Space Center to be used on the first uncrewed SLS mission, Exploration Mission-1, in 2018.